In most views, right-click in the display to bring up a menu and choose the Display Settings option. This window includes a tab with options to link many of the display characteristics between windows. Want to scroll through sections or adjust the scale of one window without updating others? Uncheck the link boxes allows a window work independently, so that changing the volume, zoom, and position will only occur in that window. Compare the same section on different volumes. Link up your IL/CL or arbline views to display a section on different volumes while keeping the scale and position consistent between views as you move through the data. Viewing the same section on different angle stacks, or comparing the input and output volumes from a process is effortless. Easily change the position of section views in the map window and watch as the section updates in your other views. 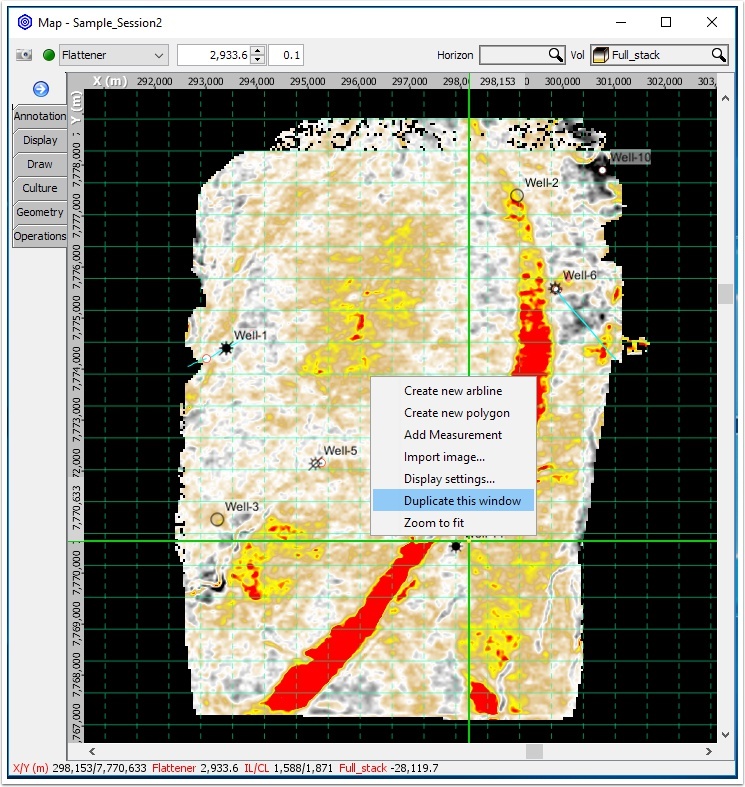 In this example, an arbline is modified in map view and the updated section can be seen in the 3D view. The position of IL/CL and gather views can also be easily changed by clicking a new position in Map view. Moving the offset position marker in gather view will update the display in map view and section view when these views are linked. 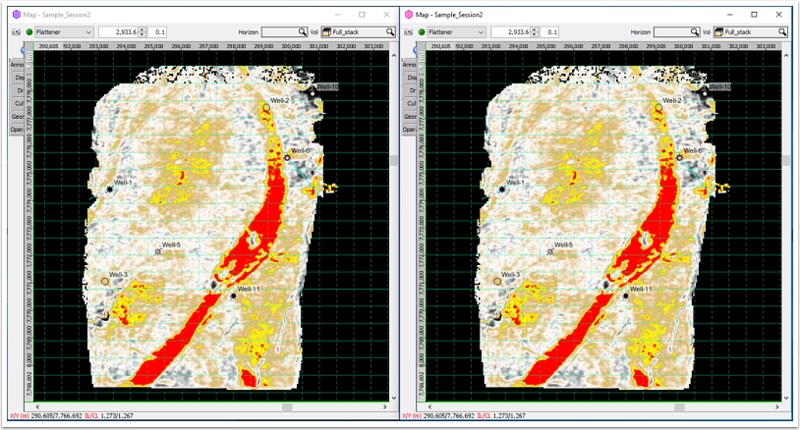 In this example we’ll duplicate the map view window to display data from the same timeslice on different volumes. 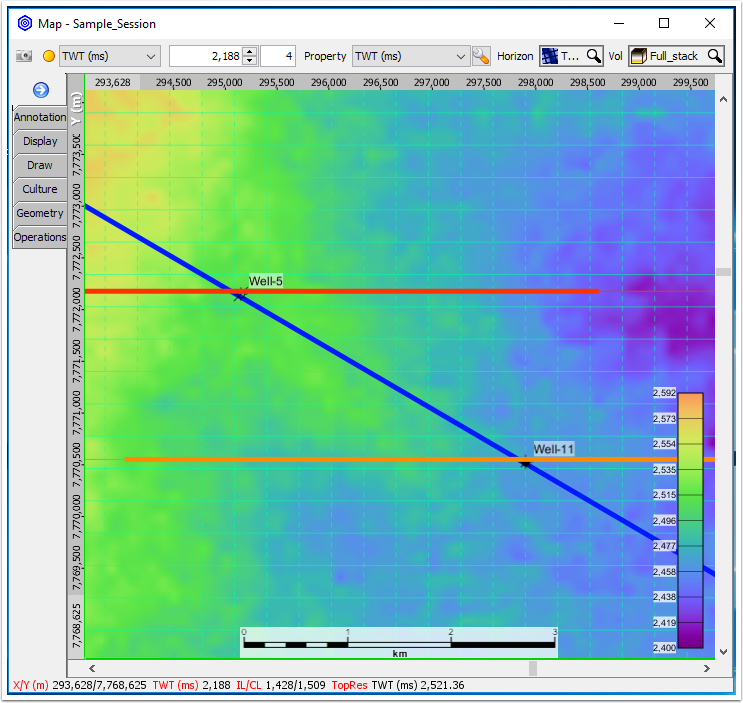 This will provide an efficient method to compare timeslices from different volumes, while viewing the same area, and retaining the same scale between views. Shown below is a timeslice from a full stack volume flattened between two horizons. 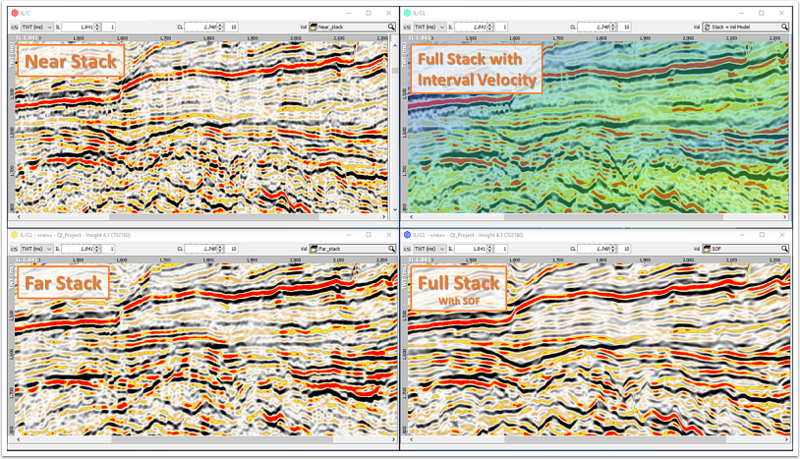 The interval we’re investigating contains strata thought to be deposited in a fluvial environment, so we’d expect to see channel-like morphologies when analyzing stratigraphic horizons. 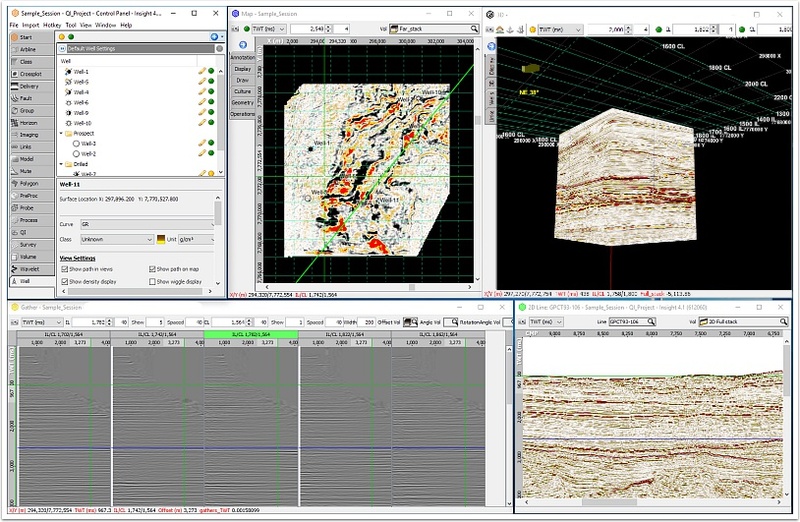 Since the seismic has been flattened between two intervals, we’re able to view timeslices which approximate stratigraphic surfaces and quickly investigate this interval for potential reservoir elements. 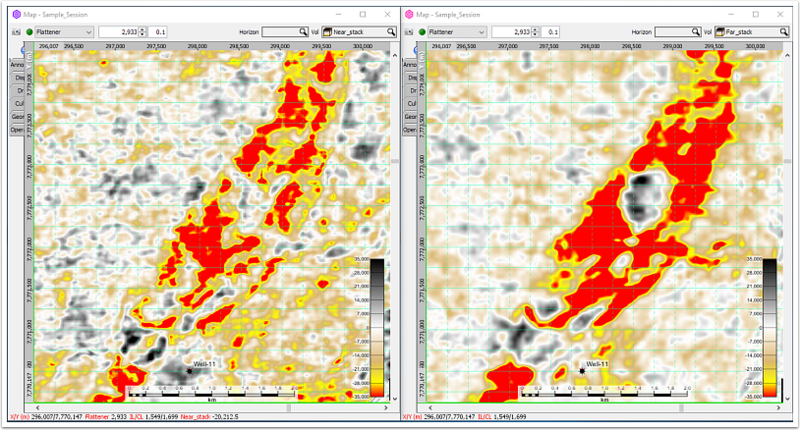 By displaying multiple map views, we can evaluate amplitude change with offset by comparing timeslices taken from near and far volume side by side. 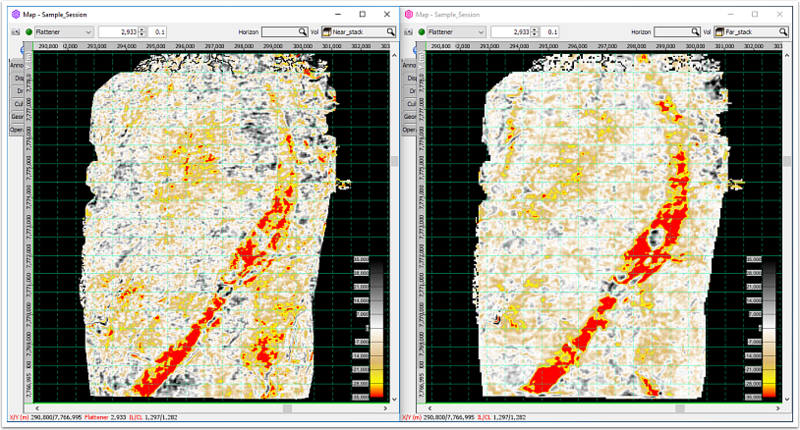 In the image below, the map view has been duplicated and the same flattened timeslice from the full stack volume is seen in both windows. 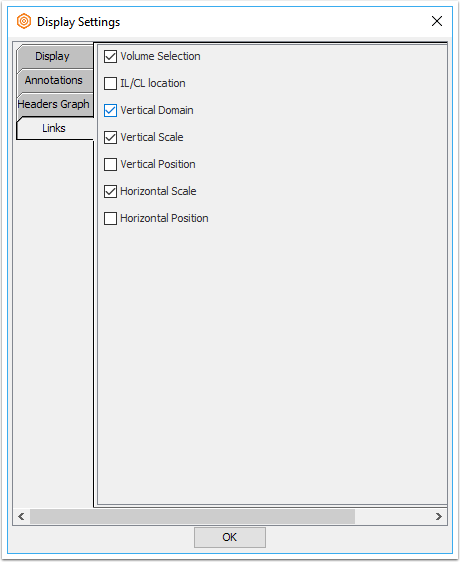 In order to display different volumes in different windows, we’ll need to unlink the volume selection in each of the windows, then select the near volume in one window and the far in another. Once the Display Settings window is open, click in the Volume Selection checkbox to unlink the map view windows. 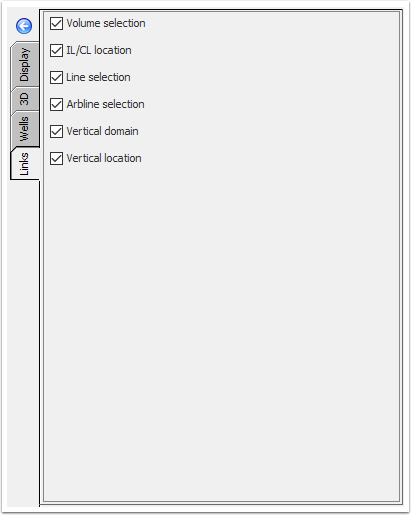 We’ll keep the Vertical Domain, Vertical Location, Zoom, and Position checkboxes checked so that each window will retain the same scale and position in each window. The display settings window also gives the option to display the volume colorbar, which is useful when comparing timeslices from multiple volumes. Keep in mind that modifying the display settings only alters the settings for that window. After you have unlinked the volume selection for each window, you’ll be able to display different volumes in each map view display. 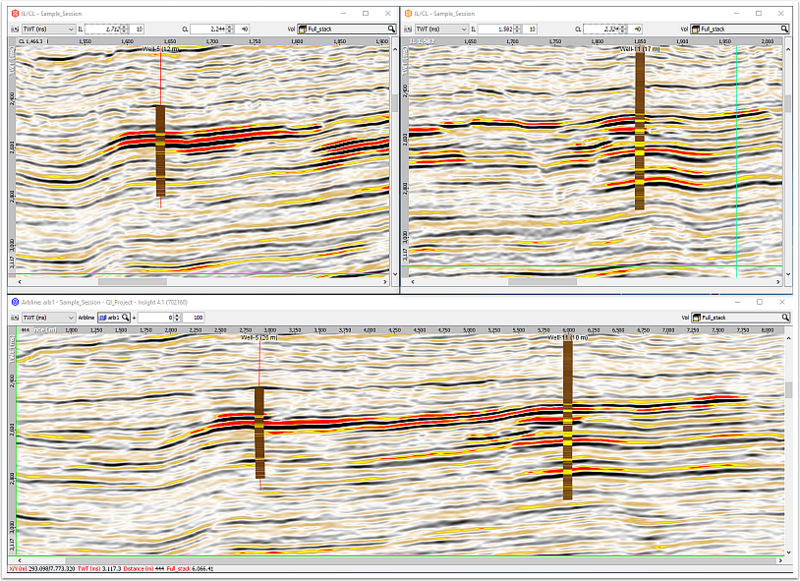 Displayed below are near stack and far stack volumes, with colorbars set to the same scale. To cycle through timeslices, place your cursor above the timeslice position indicator and use your mousewheel to scroll up or down. By linking the position between your section view and map view, you can adjust the timeslice position seen in the map view by clicking on a new location in section view. If you would like to link these views, simply check the ‘Position’ box in the Display Settings window for each separate view. Alternatively, you can move through timeslices by clicking on a position in section view. This allows you to quickly move to interesting events seen in section view and analyze them spatially in map view. Because the scale and position are still linked between views, zooming in and moving the timeslice in one view will show the same area in the other view. 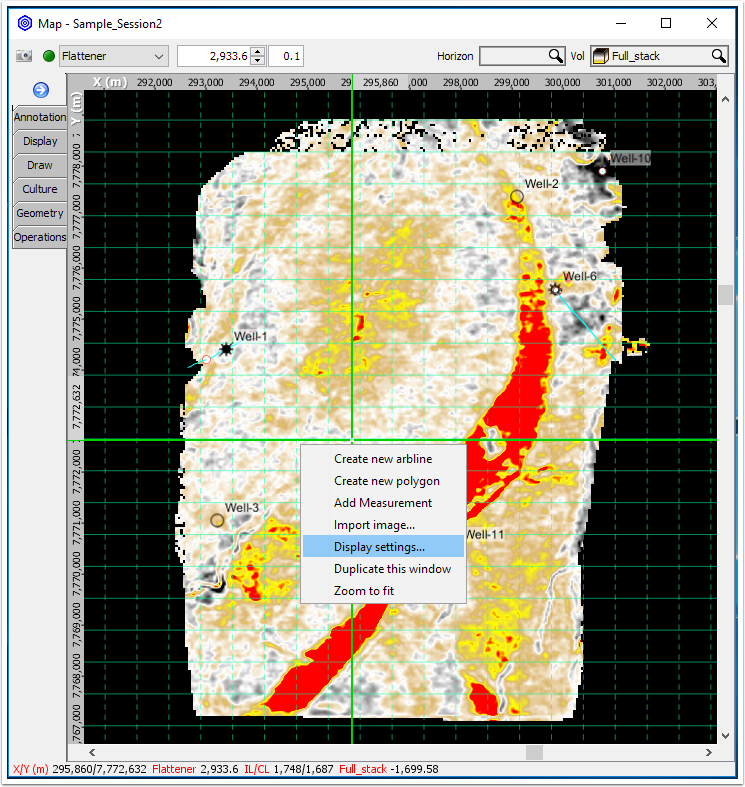 Displaying multiple sections allows for quick comparison of subsurface features located in different map areas. 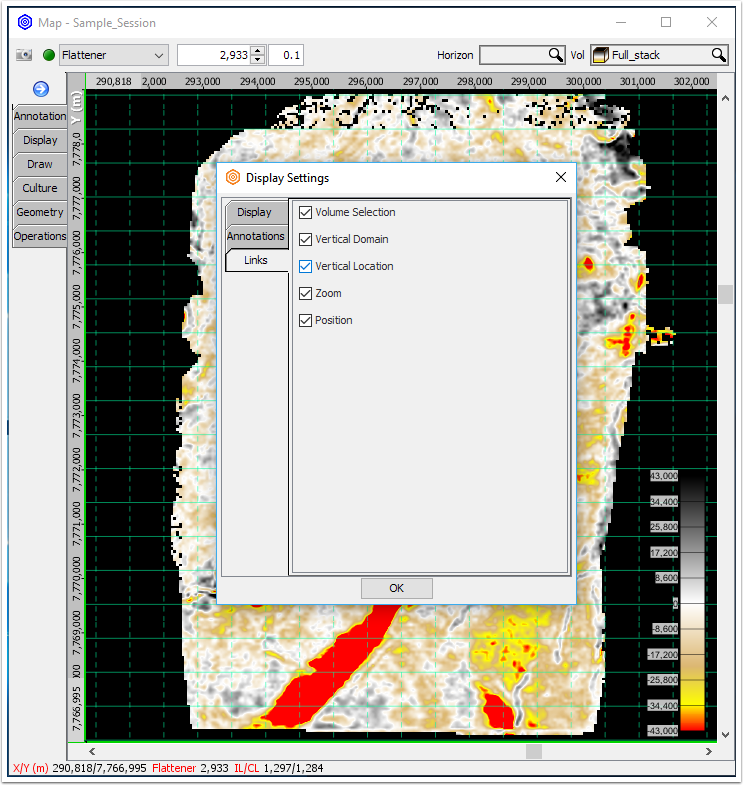 Insight makes creating these views easy -- simply open a new section view, unlink the vertical and horizontal position checkboxes for both of your IL and CL section windows, and click on the portion of the map where you would like to view a section. 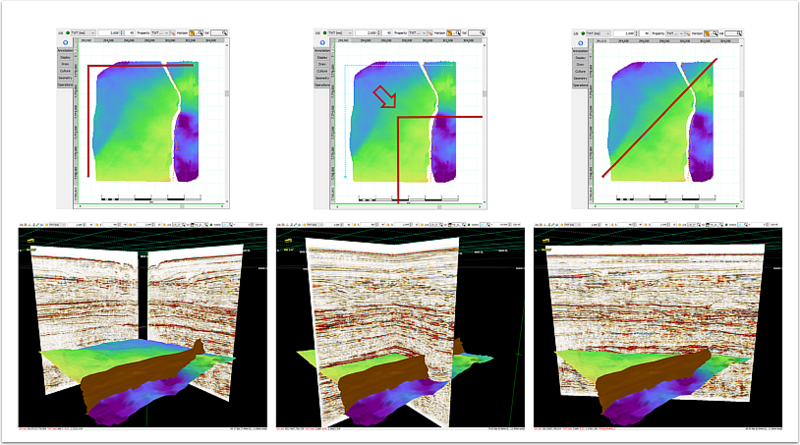 In the example below, two inlines are displayed showing sections through different wells, along with an arbline showing a section through both wells. You’ll have no problem keeping track of where these sections as your sections will be automatically color-coded between section and map views. The color of the icon seen in the upper left hand corner of the section window corresponds to the color of that section’s line displayed in map view, allowing for a quick check of a line’s map location.